A mysterious fantasy for ages 12 and up. Marc Remus is an award-winning German Neo Pop-Art painter with exhibitions world-wide. He was educated in the United States, graduated with a BA in art and illustration from Art Center College of Design in Pasadena, CA, and lived in Japan and Central America for some years. He has travelled to more than sixty countries and visited over a thousand cities, of which he has painted over two hundred. His work has been featured on TV and in many magazines and newspapers in Germany, USA, and Mexico. During his studies in California Remus took his first children’s book illustration class. His teacher inspired him to start writing and not just illustrating. The result was a middle grade series, Magora, which won numerous children’s books awards including Readers’ Favorite Book Award, Moonbeam Children’s Book Award and the IPPY (Independent Publisher Book Award). Remus has travelled many times to Ireland and Scotland and developed a passion for these countries over the years. While he stayed with his family in Arizona, he began writing his first young adult novel. The Language Thieves interweaves the writer’s fantasies with his experiences in Ireland, Scotland and Arizona, making the book a unique multicultural blend. Remus has studied many languages over the years, among them is English, Spanish, German, Japanese, French, Chinese, Garifuna, Greek and Quiche. He continues to travel, write children’s books and exhibits his artwork in galleries. The Language Thieves is a young adult fantasy by Marc Remus. Sixteen-year-old Daniel is none too happy about his father’s decision to move the family from Arizona to a remote Scottish island, of all places. His mother was stricken by a mysterious illness that has rendered her incapable of communication. Daniel speaks English and Irish Gaelic although he isn’t too keen on overtly displaying his Irish roots. Once on the island, he meets two new friends, Jenny and Connor, who are as suspicious as he is about a strange, elusive tribe that inhabits a part of the island: the Cerebrals, with their own unique culture, obsession with language, and their worship of the brain. The Cerebrals keep themselves apart from the rest of the population, and don’t want their kids to have anything to do with the locals. A bit difficult when Daniel finds himself falling for the cute Emily, who just happens to be a Cerebral. What is the mystery behind the Cerebrals, and do they have anything to do with Daniel’s mom’s affliction? How can they possibly be dangerous? This is a young adult fantasy that is quite different from the norm. The plot dives back into ancient history and draws together some very intriguing theories. Young adult fans of Atlantis and ancient civilizations will devour this story. The plot is full of twists and turns and although I am not usually surprised, this book made me sit up. The action starts right away, aboard the ferry en route the island, when a young teen (Connor) is attacked by strange men. The pace is steady and escalates as the youngsters team up to resolve the mystery behind the Cerebrals, their mission, and how it will affect the whole world. Daniel is the most well developed of the trio, but Jenny is a solid sidekick gifted with IT skills and Connor is close behind as the loyal friend willing to follow first and ask questions later. The teens sound and behave mostly as one would expect teens to do and this adds realism to the plot. The romance between Daniel and Emily is sweet but underplayed so that it does not overshadow the main plot. The intrigue and mystery behind what the kids discover will certainly have young readers doing their own investigations into history, culture, and the value and place of ancient languages in society. I liked this thought-provoking angle – just how many ancient languages are still spoken today, and how many have been lost in the last century? The descriptions of the Cerebrals and their culture, dress and architecture are unique and showcase the author’s incredible imagination. A great cover and good layout and editing add to one’s reading pleasure. Themes of friendship, loyalty, teamwork and family abound. This is an intriguing fantasy by Remus and perfect for the young adult market. Do you speak more than one language? Beware. A mysterious tribe -- in a remote part of Scotland -- called the Cerebrals steals languages from people’s minds. Sixteen-year-old Daniel is a newcomer in Inverdee and he speaks English and Gaelic. His new friend, Jenny Jokinen, warns him to stay away from the Cerebrals, but Daniel is attracted to one of them, Emily. 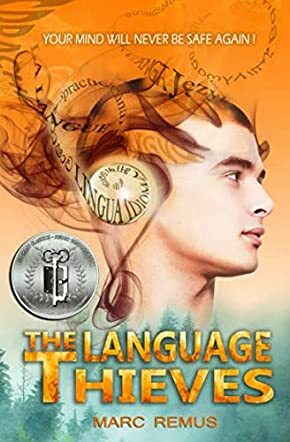 When Daniel, Jenny, and Connor are able to sneak into the forbidden Cerebral village and investigate further, they realize that there’s an ancient agenda that will destroy all languages in the world. The imaginative concept of The Language Thieves by Marc Remus is unique and well-developed into a premise. The plot is fast-paced and the narrative is straightforward but engaging. I like how the popular legends are incorporated into the Cerebrals’ backstory. The young protagonists are easy to root for. Daniel is determined but a bit compulsive. I have a soft spot for the genius Jenny, who’s the trio’s main source of knowledge about the Cerebrals. Somehow I feel Connor slightly fades into the background compared to the other young characters, but he does play a vital part in moving the story forward. The story leans towards a sense of intrigue and conspiracy. Remus also gives us plenty of suspenseful moments, action, great plot twists, and a solid ending. One’s language is part of one’s identity－it’s a great message to instill in an ingenious modern tale. The Language Thieves may seem more suited for teens but it’s definitely a great story with its own level of quirkiness that everyone can enjoy. The Language Thieves: A Young Adult Fantasy is a highly imaginative novel written by Marc Remus. Sixteen-year-old Daniel Sullivan is living in Phoenix, Arizona with his parents that are of Irish descent, when his mother, Lauren, who speaks the ancient Irish Gaelic language, suddenly gets mysteriously ill and is paralysed and unable to speak. His father, to Daniel's consternation, relocates the family to Inverdee, a remote island in Scotland. On the way to the island, Daniel witnesses a strange event in the ferry involving Connor, a boy roughly his age. He also meets Jenny, a strange girl who warns him not to speak in Irish Gaelic once he reaches the island, and warns him about the Cerebrals. Little did Daniel know that he was in for the adventure of his life. Marc Remus' The Language Thieves: A Young Adult Fantasy Novel is a refreshingly delightful read. The story opens with an intriguing phenomenon that leaves Daniel, one of the main protagonists of the story, curious about the Cerebrals, a tribe in Scotland that is elusive. They are so mysterious that many people believe the Cerebrals are just a product of a fertile imagination. Author Marc Remus brings the mysterious Cerebrals to life and the result is a tale that is both fascinating and entertaining. As Daniel and his new friends, with the help of Emily, a beautiful Cerebral, seek the truth about this elusive tribe, one can't help but cheer them on. And this is because the plot is woven in such a way that things fall neatly into the right places and at the right time. A very entertaining read! Do you speak multiple languages? Did you ever wonder why some languages are no longer spoken? Or why there are different languages? Have you ever met a Cerebral? Marc Remus has done it again! He’s created another fantasy world that drew me in on page one and keeps me wondering until the final chapter. I cared about the characters, cheering them on and worrying about their safety. I loved the vivid setting descriptions artistically woven into the plot. The way Remus pulled history into the story is wonderful. And the action is great! I didn’t want to put it down. I strongly recommend this book for young adult readers and adults. This is an exciting and suspenseful fantasy book. It’s about family and friends, and what we are willing to do for them. It’s a combination of legends and modern technology and depicts preservation of traditions as well as embracing innovation. It has a set of delightfully charming characters like the stubborn and determined Daniel, skeptic but supportive Connor, smart and brave Jenny and the sweet and elusive Emily. Scenes and settings are vividly described while dialogues between characters sound natural making the book an easy read that can be finished in one sitting. Needless to say, this is one very enjoyable book. Was drawn to the book by the cover - looked unusual and caught my attention. After a short read I realized it was right up my alley. It's a cross between fantasy and sci-fi. Unlike other adult fantasy books, it doesn't labor to impress with unnessarily elaborate words and phrases but focuses on the story. It's just the right choice of words for a young adult book. With only a few simple sentences, the author manages to describe scenes, make characters come alive and pull the reader in. The end is revealing and don’t want to ruin so will just suggest reading to find out! Will definitely be reading more by this author. Glad I picked up this book! My review is a bit biased as I l know the author but that does not take away from the genius of this book! Having had the opportunity to see how Marc's mind works while coming up with the concept of this book to seeing the finished product is AMAZING! He creates characters and storylines that are as detailed and beautiful as his artwork. Weaving the past with the future, while intersecting the depths of relationships between family and friends, keeps you captivated and wanting more. My daughter, who loves languages as well, could not put it down until she finished the book! Trust me, anytime I can get her to put down her tablet or phone and dive into a fantasy world is a big plus for me. Marc takes his love of art and language and creates such beautiful stories that everyone enjoys reading. I highly recommend this book to EVERYONE!! I discovered this book on social media and immediately had to get it. The cover and the title got me interested in the first place but once I started reading, I was captured by the plot. Languages are a fascinating subject for me, and the idea of a strange tribe in Scotland stealing languages from people’s minds was fantastic. The references to Atlantis, Babel and some other mystical events are beautifully interwoven into the story and the ending is full of surprises. Of course, it is a young adult story and so there had to be a teenage love story involved, but I am glad that it didn’t take over the plot, but it was gently fitted into the story. I really enjoyed the read and would recommend it to anyone. The cover is beautifully done and it invites you to open the book to find out the story behind it. Once inside the main characters develop their own story lines and yet join together to make this one of the most enjoyable tales I have read in a long time. Daniel, Connor, Jenny and Emily are part of a fantasy that seems real enough to actually happen. Each page begs you to read on to learn more. The ending will surprise you. Marc's talent is displayed with each character he brings to life. Spreading the word to all I know to read this book. from a young adult's perspective. This is a well written book with particular good usage of adjectives. I feel this book would be very interesting to teenagers but even adult audiences could like it this is a well written book with particular good usage of adjectives. I feel this book would be very interesting to teenagers but even adult audiences could like it. Gaelic is such an interesting language anyway, and if anyone has ever traveled there they could understand why this language has been used as the topic of the book. I loved this story from the very first page. The plot and characters are fantastic, and the story pulled me along every bit of the way. So original, and captivating from the beginning, I read it quickly so I could find out what was going to happen. A great book for schools, as it brings in very interesting history and would make for great discussions. Marc Remus is an author I particularly enjoy reading. Highly recommended! Lose Yourself in this Engaging and Brilliant Fantasy! I am a huge fan of fantasy novels, but many of them fail to hold my interest as they seem to be the same story over and over again. This compelling read by the brilliant Marc Remus was so hard to put down! It combines history and the power of language - two of my favorite topics. The characters are brilliantly drawn - you can "see" them - and the story is written in such an engaging way that you really find yourself along the journey with Connor, Jenny and Daniel. If you're a fantasy lover, or fascinated by how language connects and inspires us, or just a lover of a good book - do yourself a favor and read this book! What a wonderful story! Some fantasy, a little bit of sci-fi and a love story on top of this. There were some great descriptions, some funny scenes and characters that I loved. The location in Scotland, where the story takes place, is very mystical and inspiring. I was able to finish reading the book within a day. It is the perfect read for a gloomy day because it keeps your mind occupied, excited, and entertained. It makes you forget everything around you. This book was an exciting read with a lot of surprises. It takes place on a Scottish island where the main character, Daniel, discovers a tribe that steals languages from the brain. Curious as he is, he tries to find out what technology these "Languages Thieves" have or what allows them to do such an unbelievable thing. But his research puts him in danger of losing his own language now. I found the story fast-paced, easy to read with a fascinating plot and neatly written. I wished it was a little longer but since it is geared to children and young adults it is probably the right length for this age group. I think it is a thrilling read for any adult, not just young ones. This is definitely a book that I would recommend! I really enjoyed „The Language Thieves.“ It is easy to read and focuses on the plot rather than trying to be overly descriptive. However, with just a few words the author pulls you right into his world and keeps you on your toes from the beginning to the end. The Cerebrals (As the language thieves are called) and their town are fascinating. I wanted to know from the beginning who they were and what their master plan was. And so I kept reading without putting it down. The end was very surprising to me. I had not expected such a twist. I don’t want to give out any spoilers but the end was very satisfying to me. I also loved the variety of characters that the author created. Emily the shy Cerebral girl; Jenny the tech girl; Connor the smart one; and the main character, Daniel. They all seemed very real to me, especially Daniel who struggles with a lot of self-esteem issues because of his multicultural background. I think a lot of teenagers can related to this. To sum things up, the story is exciting, not only for young adults. It is written in a very compelling way so that nobody will have to look up unfamiliar words. The plot has a lot of surprises that included historical legends like Atlantis, the Confusion of Tongues and the Deluge. It’s an amazing book! I got the book because I found the topic of stolen languages interesting and because the cover was great. When I started reading I was taken to another world. The story was packed with action and I enjoyed every moment. The plot has a lot of surprises in store for the reader and mixes ancient stories with modern technology. I had such a great time that I finished the book in one setting. I can recommend this book for kids, young adults and adults alike. I got The Language Thieves because I became a big fan of the Magora fantasy series by Marc Remus. My niece loved that series, so I was pleased to find a new title by the author! The Language Thieves is completely different than his other books, but no less exciting and thrilling! The audience I’d say is young adults rather than middle graders, but I’m sure adults will enjoy it as much, at least I did. The story is well-written, the characters are believable and memorable, and the plot moves fast. Anybody who speaks more than one language or has studied a language in the past can relate to this topic.. I was fascinated by how the author weaved old legends to his own story, taking the reader to another world, somewhere on a mysterious island in Scotland. Mixing fantasy, sci-fi and love, this is a great read! A great reading that will fascinate you with its ups and downs and its intriguing plot! A beautiful reading and companionship on my holidays! a thrilling book that does not let you put it down before you read the ending titles!